Stool and barstool. Tube frame 30 x 15 mm. Ø 32 cm seat in pressed sheet steel with central hole. 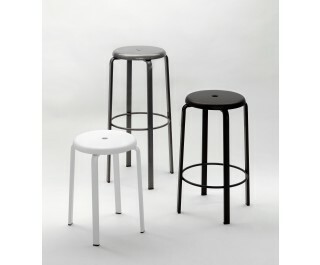 Treated for outdoor and polyester epoxy painted, embossed black or white. Since 1989, when the company was founded, Horm furnishes living spaces by creating emotions and transforming homes, public spaces and workplaces into warm, welcoming and functional environments. The values that distinguish Horm.it are: design, entrusted to internationally-famous architects and designers, passion, which is the engine that drives the entire process of generating ideas and, finally, the home, understood as a private or commercial environment and destination of all products of the collection. On the living-space design landscape, Horm.it defines its identity through two distinct design approaches, proposing both pure, functional forms and true domestic sculptures that occupy the subtle space that divides seriality from art. Wood, the star of Horm.it’s history, is combined with glass, stone and metal that, together, offset each other in an aesthetic logic from the neutral tones of white and black, contrasting with possible optional lacquered colours. Today ZEUS is a design furniture collection, self-produced, distributed worldwide. Main designers are Maurizio Peregalli , Doriana and Massimiliano Fuksas, Franco Raggi, Marie-Christine Dorner, Ron Arad.The choice of materials is industrial and natural at the same time. Linoleum flooring is used to cover tables and consoles. Iron sheet steel, phosphatized and waxed, is used combined with stainless steel: precious and poor materials together. Extreme contrasts as a whole, the strength of stainless steel and the materiality of iron.